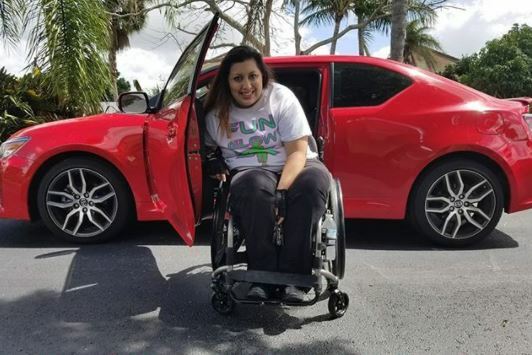 Jessika Kattah De la Torre is one woman on wheels you’ll never forget, but it’s not because she uses a wheelchair. With a personality so big it eclipses a room, this Florida–native loves life and is passionate about everything she does. Health issues however have followed this fierce woman since she was a teenager. A spinal cord injury is just one of the health issues she’s had to fight through. What we love about Jessika is that she hasn’t let these issues stop her from having the passion for life she’s always had. Always a huge fitness fanatic, she’s still one till this day. She’s also found new passions since her injury, from the fun – indoor skydiving – to the serious – spinal cord injury research advocacy. Read more about Jessika’s ongoing journey below. At the age of 14, doctors found a benign lipoma tumor on her spine. Fortunately, they were able to remove it and she was tumor–free, without paralysis, for 12 years. At the age of 26 however, the tumor returned returned, and this time she became paralyzed after she underwent another surgery to remove it. Although after a few months in rehab she was able to walk out of the hospital using a walker, the tumor returned again. She is currently a full-time wheelchair user with a T2 incomplete injury. As one can imagine, the ups and downs of having a tumor can be taxing, but this former “gym rat” is tough. 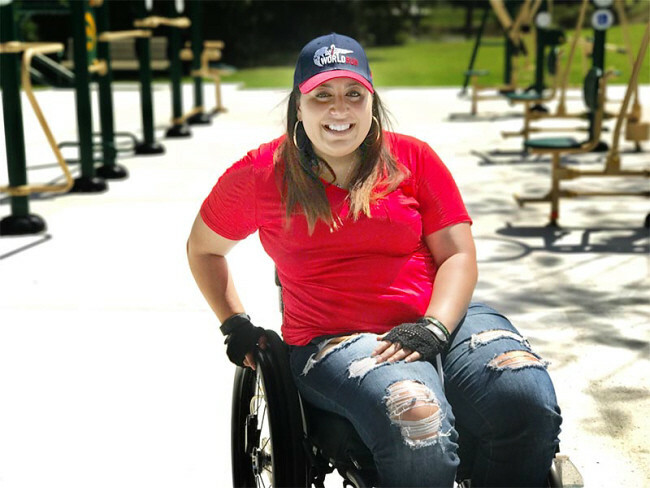 She now has two passions – raising awareness for spinal cord injury research and adaptive sports. It began when Jessika signed up for Red Bull’s first Wings for Life World Run in 2014. She has participated in this awareness event since it’s inception and is one of their official Ambassadors. She’s also discovered adaptive fitness parks that are around the Ft. Lauderdale, Florida-area where she lives. She loves making videos showing how to use these parks from a wheelchair. “I never give up,” she says and you can especially see this in her videos. Jessica, now 31, has also discovered the freedom of adaptive SCUBA since her injury, as well as adapted surfing and indoor skydiving with iFLY Ft. Lauderdale. She can be credited for helping spread awareness of indoor skydiving for wheelchair-users throughout Florida. Most recently Jessika decided to switch gears. 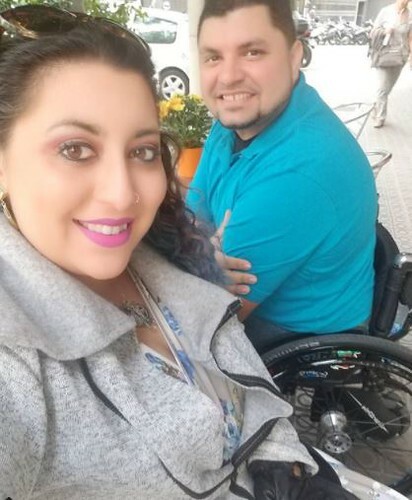 She met another paraplegic after her injury, Rey, and they fell in love. An adorable love story, Reinaldo and Jessika share their adventures together on her Youtube channel here using the hashtag – #ItsThatWheelKindofLove. They share everything from how they travel together, like packing two manual wheelchairs in the back seat of a car, to their adventures around Florida, whether they’re surfing, going on a day-trip to Saint Augustine or to a friend’s wedding. They even went to Spain just a few months ago and made several videos on international travel. We can’t wait to see what they record next. Jessika also speaks about her injury, spreading awareness on the importance spinal cord injury research whenever she can. She is a true soldier in the SCI army and we are grateful for all of the goodness she’s infusing into the community. How do you find a new passion after a SCI? This entry was posted in SCI Superstars and tagged adaptive SCUBA, adaptive surfing, ifly ft. lauderdale, indoor skydiving all-abilities, jessika kattah, spinal cord injury awareness, spinal cord injury florida, wings for life world run on November 27, 2017 by Tiffiny. Thanksgiving is just days away, and you know what that means…it’s time to start holiday cooking prep. If you’re a wheelchair-user, you already know what masterpieces can be done. Even if it’s just a side dish, cooking on four wheels ain’t nothing but a thing. There are a ton of tips out there to help you put together a holiday dinner as stress-free as possible. From organizing your cooking space so everything is in reach to buying must-have cooking tools that can overcome nearly any limitation you have, read on for timely tips to help improve your wheelchair holiday cooking game. No matter what you’re making, holiday cooking usually requires a few more steps than the average recipe. You’re always going back and forth to the fridge or the pantry as you’re cooking. But if you use a wheelchair, rolling back and forth to these spots can get tiresome, plus if it’s a time sensitive recipe, you may not roll hustle fast enough. This is why before you cook, you should always prep you’re cooking space. This means having all of your ingredients out and ready before you begin cooking. For those who need extra time pouring and measuring ingredients, also do this before you begin. If it takes longer for you to cook and bake in general, consider prepping as much food as you can before the actual day arrives. There are many holiday recipes you can make beforehand – up to 2 to 3 days prior – that will taste as good as if you made it the day of the holiday. Pies, bars and cakes work great 2-3 days before. You can also prep your stuffing and vegetable dishes the day before and just pop them in the oven when you’re close to serving time. If you don’t have the accessible kitchen of your dreams, that doesn’t mean you can’t cook. Many people will put an electric/pluggable stove top on a kitchen table that they roll underneath. This is also where you can do your food prep. Another great place to prep your food is on your lap. To do this, use a thick cutting board that is square so it can sit on your lap safely. Many people call this a lap tray, but a standard cutting board will suffice. Having this additional flat space that is directly in front of you is very helpful for quadriplegic cooks with poor balance. If you have limited dexterity, you should also consider buying an automatic can opener. They runs on four AA batteries. This is especially handy during the holidays since so many recipes call for canned foods, from cream of chicken soup or canned pumpkin. You can buy a battery-powered automatic can opener at Walmart or Target for $15.00. But this is just one sweet “auto” item. If you have limited dexterity, there’s seems to be a tool that will do nearly whatever you’re trying to do for you when it comes to cooking, from cutting garlic and taking the shell off an egg to cutting an avocado. There are a lot of knives made for people with limited dexterity, but one of the best is the half-moon shaped rocker knife from Kitchenaid called the Mezzaluna. This knife is sharp, it can cut nearly anything you put to it, which makes it great if you have limited dexterity. The rocker knife is also great because it’s easy to hold because of it’s giant red rubber handle. If your kitchen also lacks a truly accessible oven, you should purchase a countertop oven (aka toaster oven) and put it directly on your kitchen counter. This will also put it at your level, so you can put in dishes/pans and take them out easier and safer. If you already have an oven, a countertop oven will come in handy during the holidays. They offer additional oven space when making multiple dishes, and they’re great for holidag baking. Still not feeling like cooking? Then don’t! Making anything “semi-homemade” can be just as good. Whatever you do, don’t let the idea of cooking for the holidays overwhelm you. Cooking and entertaining can be some of life’s biggest rewards, even sitting down, and it can be done. What wheelchair cooking tips make your holiday cooking/baking fest a smashing success? This entry was posted in Feature stories and tagged holiday wheelchair cooking, wheelchair cooking advice on November 17, 2017 by Tiffiny.